Waris Dirie was born into a nomadic clan in Somalia in 1965. At 13, she escaped an arranged marriage by fleeing on foot across the desert. She landed in London where she worked first for wealthy relatives, then at a McDonald’s. She was discovered by photographer Terence Donovan while wiping tables. Improbably, Waris became a top model, appearing in ads for firms including Chanel and L’Oreal. In 1997 she spoke for the first time with a magazine about the female genital mutilation (FGM) she had undergone at age three. Abandoning her modeling career, she became a United Nations ambassador for the abolition of FGM. 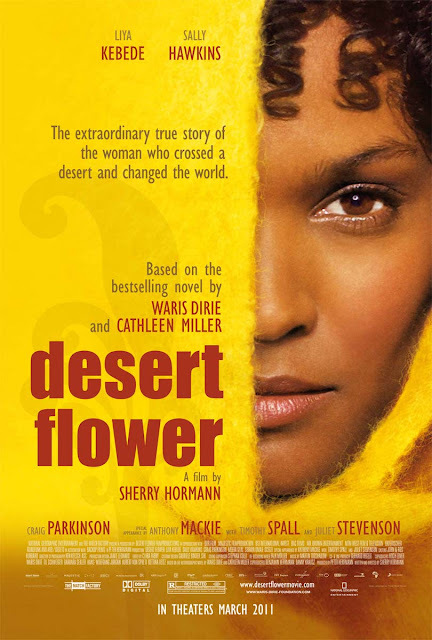 Waris’s autobiography became an international bestseller, and DESERT FLOWER is the gorgeously photographed adaptation of her story. It follows Waris (played by Ethiopian supermodel Liya Kebede) from her beginnings as a goat herder, to London and the world of top modeling, to the international spotlight of the United Nations. The film manages to incorporate surprisingly light-hearted moments into its portrayal of a difficult subject. DESERT FLOWER is the story of one woman’s victory over unimaginably harsh beginnings and her work to insure that other girls avoid the same horrific experience. Also, include the Cleveland International Film Festival on the 29th and 30th of March.